As the boys in the Goodwood Motorsport office are well aware, I am no great fan of saloon car racing. To be truthful, this minor aversion has assumed much greater significance than it ever really should have, since as a group the motorsport team are considerable fans of the genre, and I am regarded as the group’s Victor Meldrew crusty old git – a role which I am perfectly happy to play. So why doesn’t saloon or touring car racing do it for me? It’s not easy to explain. It’s really an accumulation of several things. For a start, I have never had any real interest in road cars ‘just like you can buy’, at least not beyond sitting in them, and pressing the loud pedal. For my perhaps peculiar taste they have always been completely overshadowed when there’s the rarity and sophistication of tailor-made open-wheeled Formula racing cars, race-bred Grand Tourers, or pureblood sports-racing cars for a proper enthusiast to drool over. I discovered early on that my dismissive reaction to tin tops can really wind up fans of the class. Maybe I shouldn’t admit to it, but finding this reaction really encouraged me to more outspoken (and largely false) criticism – just for fun. We’re all just school kids at heart, you see, who have never grown beyond the wide-eyed enthusiast stage – it’s just that we tend to be enthusiastic about different aspects of the same basic motor racing game. I also found long ago that about the most incendiary thing I could say about saloon car racing was that if I wanted to see a bunch of mundane tin tops really going for it, then I’d just camp out on London’s embankment in the rush hour and watch it for free. But where would be the interest in that when there were flat-12 Ferrari 1512s, air-cooled Porsche 917 Longtails, monocoque Lotus 27 Juniors, and Aston Martin DBR1s – surely the best-proportioned and most beautiful British sports cars of all time? – to be seen and savoured instead? Oh yes – and while I’m in the middle of this confessional therapy – there’s another reason why tin-tops generally leave me cold. Ever since the roofed-in, belted, caged and fire-proofed drivers of these things became just about the best-protected pilots in the business, the category became pretty much a free-for-all full contact sport in which for my taste unacceptably rough-house driving tactics became not only standard but apparently expected and acceptable practice. In short, if I’d ever been a steward at a saloon car race meeting, by the end of each outing a couple of drivers would probably have had their licences suspended. And by part-way through the championship series there’d have been a 100 per cent turnover of drivers, since entrants would have had to bring in fresh ones to replace those I’d condemned for being naughty boys on track. I really don’t like bumping and barging with little prospect of proper cost. It offends me. Historically, there was a very serious race organised for closed production-type cars as a supporting event as early as the 1914 French Grand Prix at Lyon-Givors. But what really sparked off this country’s modern genre was the British Racing Drivers’ Club’s organisation of the August 1950 Silverstone International Trophy meeting, backed by the ‘Daily Express’ newspaper. In those spectacle-starved early-post-war days, that new multi-race meeting was billed as ‘the greatest motor racing carnival ever staged’. Main supporting events to the Formula 1 feature were two one-hour ‘production car’ races, one for up to 2-litre cars, and the other for over 2-litres. The cars accepted were what we recognise today as sports and GTs, but showing well amongst the 2-litre Ferrari 166s, Frazer Nashes, MGs and HRGs was a Jowett Javelin saloon, whose cornering antics amused sponsor Max Aitken of the ‘Express’. 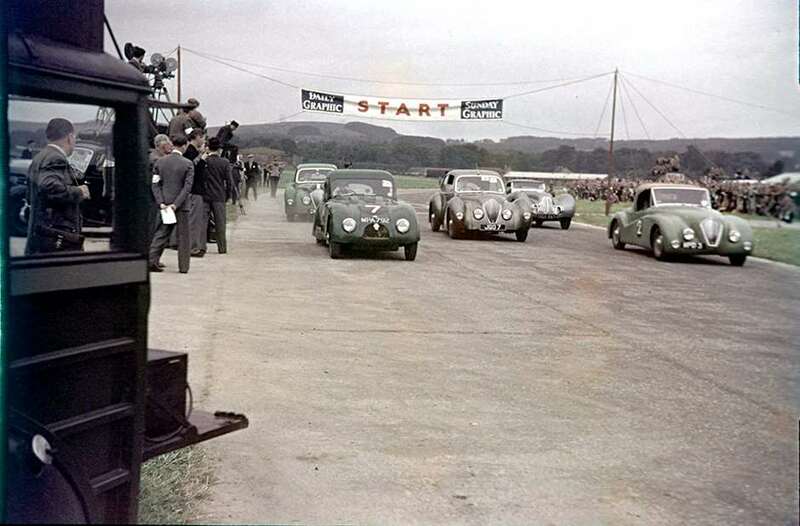 Into 1951, the May Silverstone meeting then saw a Bristol, several Morris Minors and a team of bog-slow Dyna-Panhards – whose suicidal cornering compensated for lack of straightline grunt – included in the production car race entry. Come May 1952, and with the ‘Express’s taste for entertainment, the International Trophy F1 race’s supporting programme included a dedicated 17-lap touring car event. It was won by some kid named Moss in a works-entered Jaguar Mark VII from Ken Wharton’s Healey and Sidney Allard’s Allard. The field included Alvis, Riley, Bristol, Jowett, AC and Sunbeam-Talbot entries, while Stirling described the Mark VII’s chassis as ‘handling surprisingly well, while the body kind of trailed along behind like a scarf”. The Silverstone May Meeting saloon car races quickly established the category as something more than just a one-off bit of fun. But meanwhile, here at Goodwood, the organising BARC, conditioned by its pre-war Brooklands practices, rather regarded the proper place for saloon cars as being out there on the public road rather than the race track – merely as transport to bring spectators to see ‘proper cars’ competing. Sports cars were the ones intended for sport, and even in Goodwood Motor Circuit’s opening meeting of September, 1948, the first event on the programme was for ‘closed sports cars’, and featured Healey Elliotts, the HRG Aero Coupe, and Paul Pycroft’s victorious (and plug-ugly) Jaguar SS100 special. Although the occasional humble saloon car found its way into a few BARC Goodwood handicap races through 1949-52, it wasn’t until the Club’s 11th Members’ Meeting, opening the 1953 season, that a 5-lap handicap was run exclusively for closed cars. It was promptly won by an Aston Martin DB2 – which we would now regard as a GT car – but Sunbeams, Rileys, a Volkswagen (trailing smoke?) and a 750cc Renault entertained; while the ‘real racers’ with their ‘proper’ open-cockpit sports and single-seater cars looked on tolerantly. At the Whitsun 1955 meeting, saloon car racing’s contemporary Goodwood status was then reflected by their being confined to a 3-lap Celebrities Handicap race – won by Richard ‘Stinker’ Murdoch’s Rolls-Royce 20/25 from athlete Chris Brasher’s Jowett Javelin and actor John Gregson’s Hillman Minx. You get the picture? The 1956 Easter Monday Meeting then included a production car race, but its entry was confined to what we would recognise as sports coupe and GT cars, and the winner was Ken Rudd in his AC Ace-Bristol. A real landmark was the 1957 Whitsun Meeting, in which a 7-lap closed-car handicap was won by John Sprinzel’s Austin A35, while a Ford Consul rolled at Woodcote. 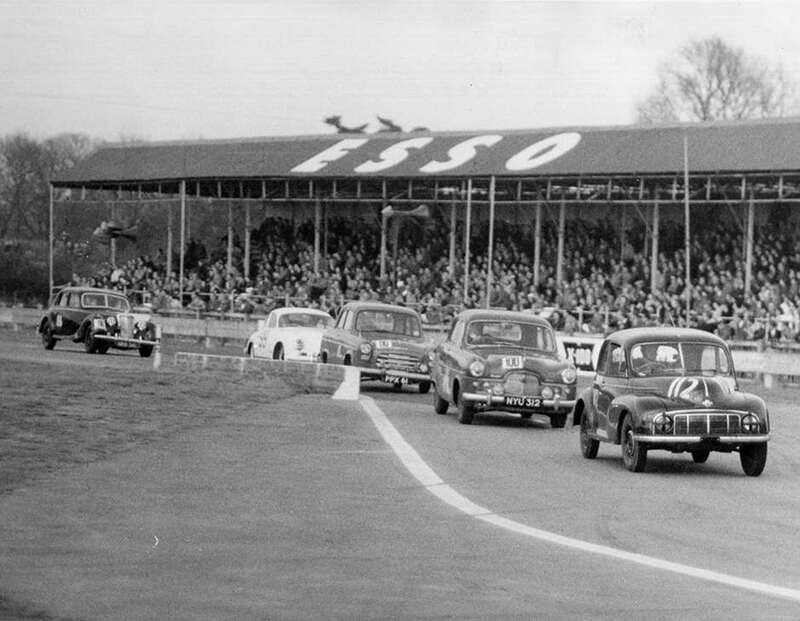 And finally, in the May 1958 Whitsun Meeting, Goodwood hosted a significant-level ‘proper’ production saloon car race. It was run over a full 10 laps and dominated by 1953 Le Mans-winner Duncan Hamilton, starting from pole and winning in a John Coombs-entered Jaguar 3.4 saloon from the sister Equipe Endeavour-entered cars of Tommy Sopwith and Sir Gawaine Baillie. While this new breed of tin-top racing toff at last made the class respectable up front, Fred Marriott’s Morris Minor shone by leading the midfield batch before the elastic broke, and John Sprinzel’s Speedwell-tuned A35 ‘tea-pot’ and Barney Everley’s Hillman Minx won their respective classes. 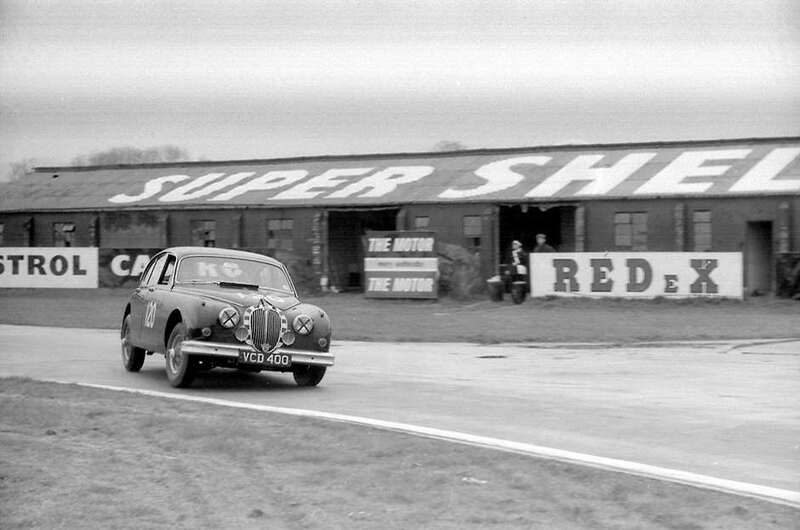 By Easter Monday 1959, championship saloon car racing was fully established, and Goodwood’s 10-lap International Fordwater Trophy was won by Ivor Bueb – roly-poly ‘Ivor the Driver’ – in Tommy Sopwith’s Equipe Endeavour Jaguar 3.4 from Roy Salvadori in the Coombs car, and team-mate Sir Gawaine Baillie. 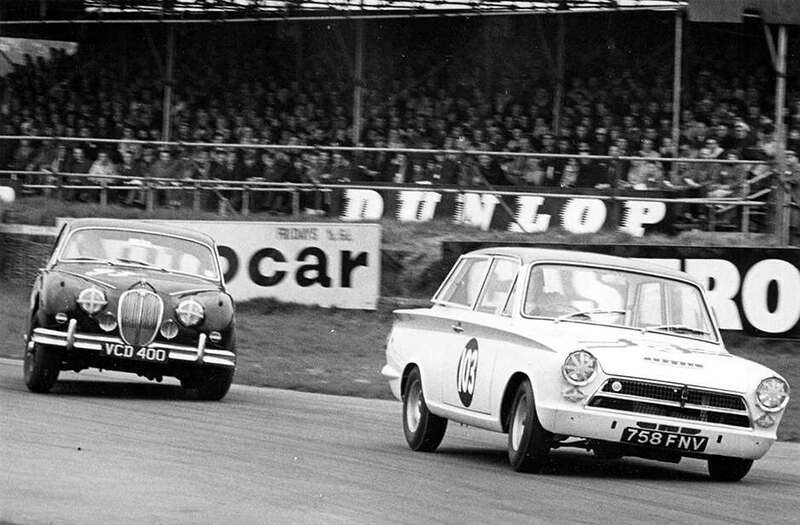 Jaguar’s stranglehold upon top-level touring car racing would be maintained until 1963 – when Jack Sears and Detroit muscle in the shape of entrant John Willment’s 7-litre Ford Galaxie would overwhelm Coventry’s finest. Certainly, for the tin-tops, breaking through at Goodwood had been a struggle. I’m still no great fan, but I have to admit that I thoroughly enjoyed the exceptional first heat of the St Mary’s Trophy race at our last Revival Meeting. So maybe I am – just about – beginning to see the point… My armour as a crusty old git might be starting to rust. Against Doug’s better judgement, touring cars are now a popular part of the landscape at Goodwood. The forthcoming 74th Members’ Meeting, on March 19-20 2016, will feature three separate groups of such cars: 1960s saloons in the Whitmore Cup, 1970s tin-tops in the Gerry Marshall Trophy, and 1990s Super Tourers in a very special high speed demonstration, ed. Ex-works Jaguar D-Type: What are we bid?